You know your soup is good when you’re enjoying it cold from the refrigerator in the Tupperware container you stored it in. It’s even better served warm. 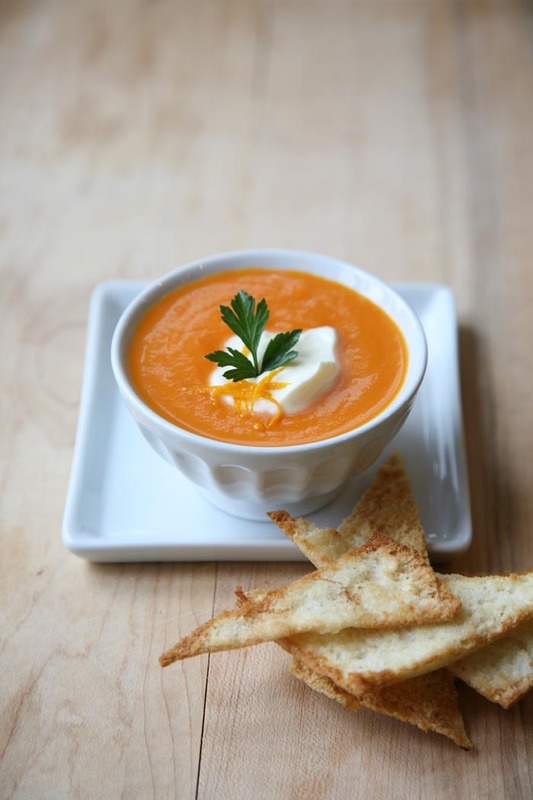 Carrot soup is pretty tame, some might say boring, until it’s cheered up with freshly grated spicy ginger, freshly squeezed orange juice and acidic tomatoes. Now, that’s a soup with personality! If you prefer a silky smooth-textured soup, as I do, pour the finished soup through a fine-mesh strainer. It’s a simple technique that gives puréed soups a luxurious texture, especially when finished with a bit of cream. Melt the butter in a large saucepan. Add the onions and cook over low heat until translucent and tender. Add the carrots, tomatoes, orange juice, ginger and only 2 cups of chicken stock. Bring to a boil. Reduce heat and simmer until carrots are tender, approx. 30 minutes. Pour the vegetables and liquid into a blender or food processor fitted with a steel blade. Process until smooth. 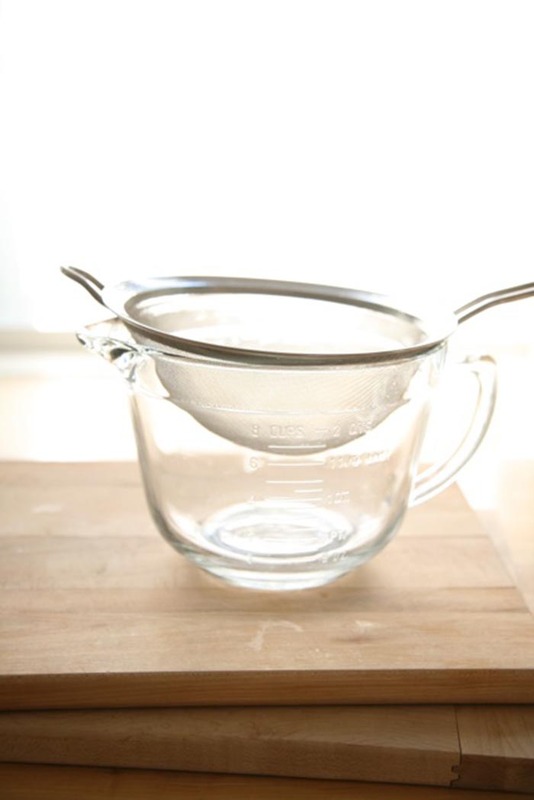 If you prefer a very smooth-textured soup, pour the finished soup through a fine-mesh strainer (pictured), pressing any remaining solids against the strainer with the back of a spoon. Return the soup to the pot and reheat. Add only enough chicken stock to reach the desired consistency — you may not need it all. Add the salt and taste the soup — you may need more salt, depending on your chicken stock. Add the cream, but be careful not to boil the soup once the cream has been added. Serve in heated bowls with a dollop of sour cream, yogurt or creme fraise, if desired. Using a knife or scissors, split open a pita pocket and cut into wedges. Place the wedges onto a baking sheet, and brush the coarse side of each piece with a little vegetable oil and sprinkle with a bit of Kosher salt. Bake at 360 F until golden around the edges. When the weather’s at odds with the season, this light, yet comforting, soup hits the spot. The aromatic Thai-flavoured broth is made of fish stock and coconut milk steeped with ginger, garlic, and lemongrass. 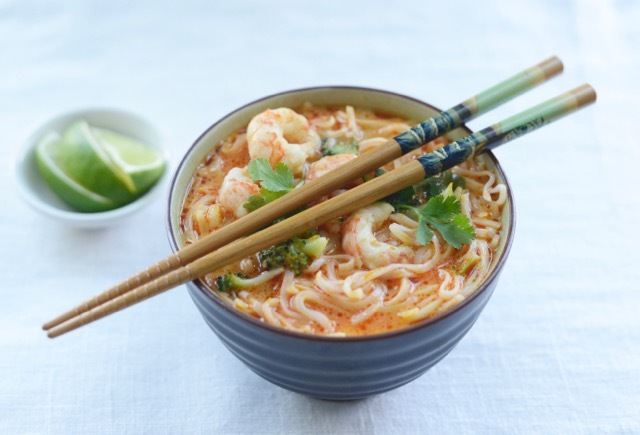 Sidestripe shrimp, rice noodles, and broccoli make for a soup that’s so heartening, you might even forget it’s raining. I prepare the vegetables and rice noodles separately so there’s no risk of overcooked vegetables or mushy noodles. Everything but the shrimp can be cooked in advance, making this an ideal company dish, rain or shine. Note – If your grocer doesn’t carry a full selection of Thai ingredients (lemongrass, lime leaves, fish sauce, etc), you’ll be sure to find them at your favourite Asian market. Heat oil in a large saucepan. Add the prawn shells, shallots, garlic, ginger, jalapeño pepper, and curry paste. Stir for about two minutes, being mindful not to burn the mixture. If your coconut milk has separated (with thick cream rising to the top), add only the thick cream to the curry paste mixture. If the coconut milk has not separated, use about ½ cup of the the liquid. Simmer until the oil starts to separate and pools on the surface of the spice mixture. Add the remaining coconut milk, lemongrass, lime leaves, stock, fish sauce, lime juice, and brown sugar. Simmer for about 20 minutes, then strain the mixture into a clean pot. Taste and adjust the seasoning with additional lime or fish sauce, if desired. Place the rice noodles in boiling water until just softened, about 2-3 minutes. Drain and rinse in cold water to prevent overcooking. Just before serving, bring the soup to a simmer. Add the prawns and cook just until they’re no longer translucent, about 3 minutes. Add the blanched vegetables and rice noodles to reheat. Transfer to warmed soup bowls and garnish each serving with cilantro leaves. Serve with fresh lime wedges for guests to add as they wish. * To blanch vegetables, place them in rapidly boiling, heavily salted water until crisp-tender. Remove vegetables with a slotted spoon and plunge into ice cold water to retain the colour and prevent overcooking. This nutrient-dense lasagna is chock-full of kale, sweet peppers, artichoke hearts, olives, and an assortment of cheese. It’s so good even meat-lovers will be asking for seconds. Lasagna can be made entirely in advance, so it’s ideal for entertaining. Plan to make it when you’re in the mood to putter in the kitchen because the prep takes time. I often make the fillings and tomato sauce one day, and assemble the dish the next. I love having a fridge-full of chopped and prepped ingredients. It gives me the satisfying illusion of being in complete control. You can use dry pasta but I prefer fresh. Whether bought from a gourmet store or made from scratch, fresh pasta will elevate this dish to another culinary level. If you opt to make your own pasta (recipe below), arm yourself with a bottle of wine and recruit your favourite cooking buddy or BFF; you’re in for a good time. You’ll need a 2 quart / 2 litre ovenproof lasagne pan, approx. 8” x 10” x 2 3/4”. Transfer the mixture to a large bowl. Add the artichoke hearts, olives, anchovy paste, hot sauce, lemon juice, and raw minced garlic. Mix well to ensure the anchovy paste and garlic are well distributed. Taste the filling and season, if necessary, with additional salt or lemon juice. Cool completely before using. Combine the filling ingredients in a medium bowl and mix until smooth. Set aside. Heat oil in a large skillet and cook onion over medium heat until it starts to brown. Add the salt, oregano and garlic, stir for about 20 seconds until the garlic is fragrant, then add the tomatoes, breaking them up with a wooden spoon. Simmer the mixture until the liquid has thickened and the flavours have concentrated, about 10 minutes. Cool slightly, then transfer to a food processor or blender. Process the mixture until smooth, but still retaining some texture. Taste and season, if necessary, with additional salt. Cool before using. If using fresh or homemade pasta, there’s no need to pre-cook the pasta. If using dried, pre-cook the pasta in rapidly boiling salted water until al dente (soft, but still resistant when tested with a knife). Rinse under cool water to prevent further cooking, then drizzle with a bit of olive or vegetable oil so the pasta doesn’t stick. Pour about 1 cup of the tomato sauce in the lasagne pan and tilt the pan to distribute the sauce evenly. Note: The balance of the tomato sauce will be poured over the top layer only. Place three pasta strips, side-by-side, over the sauce, trimming as necessary so the bottom of the pan is sufficiently covered. Smear 1/3 of the cheese filling over the pasta, smoothing it evenly with an offset spatula. Top with 1/3 of the vegetable filling, smoothing it evenly with an offset spatula. Repeat two more layers using the balance of vegetable and cheese mixtures. Add a final layer of pasta, then pour the remaining tomato sauce on top, smoothing it evenly. Top with mozzarella cheese and place on a baking tray. Bake in a preheated oven for about 40 minutes or until the cheese has browned and the filling is hot. You may have to cover the pan with foil, midway during cooking, to prevent burning. To ensure the dish is warmed throughout, place a paring knife in the center of the lasagne; if the knife comes out warm, the dish is heated right through. Combine the flour and salt in a large wide bowl, or directly on a counter top, and mix with a fork. Make a shallow well into the flour and crack the eggs directly onto the flour. Add the water and mix with a fork, gathering more flour as you mix. When the dough becomes too unwieldy to mix with a fork, use your hands to work the dough gathering any loose bits of flour. Add an additional 1 – 3 Tbsp of water as necessary by the spoonful, only until the dough comes together in a rugged ball. If using a bowl, turn the dough onto a clean, flour-dusted work surface. Knead the dough until smooth, about 3 – 5 minutes. Gather the dough into a ball, cover with plastic wrap, and allow to rest for an hour at room temperature. If rolling by hand, cut off a manageable-sized piece of dough and, using a rolling pin, roll it onto a flour-dusted work surface as thinly and evenly as possible. If using a pasta machine, cut off a manageable-sized portion of dough, dust it with flour, and feed it through the machine’s rollers at its widest setting (#1). Fold the pasta in half, dust with more flour, and repeat. Gradually narrow the rollers after each feed, flouring as necessary to prevent sticking, until the pasta is smooth and thin (about #6 on the roller’s setting). Repeat with the balance of the dough, covering the dough with plastic wrap or a tea towel to prevent it from drying out. Cut the dough into desired shapes. 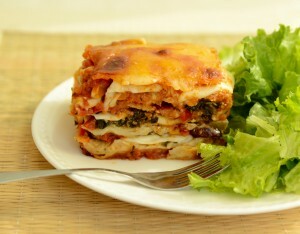 If preparing a baked pasta dish, like lasagne, there’s no need to pre-cook the pasta. If serving fettuccine-style pasta, toss the fresh pasta in a large 6 quart pot of rapidly boiling, generously salted water for a minute or two. Drain and serve. * If not using immediately, rolled and cut pasta can be dried out for an hour or more. Place pasta on parchment paper dusted with flour. Fettuccine-sized pasta can be fashioned into little nests and dusted with flour to prevent sticking. Place pasta between sheets of parchment and store in plastic freezer bags. Refrigerate up to 2 days or freeze up to 2 weeks. Frozen pasta needs no thawing, but it will take about a minute or two longer to cook. This simple recipe brings back one of my fondest food memories. I prepared this dish in France a few summers ago, when my family exchanged homes with a family from Bordeaux. Our temporary French home was beautiful but ancient with an oven so small we named it Le Easy Bake. 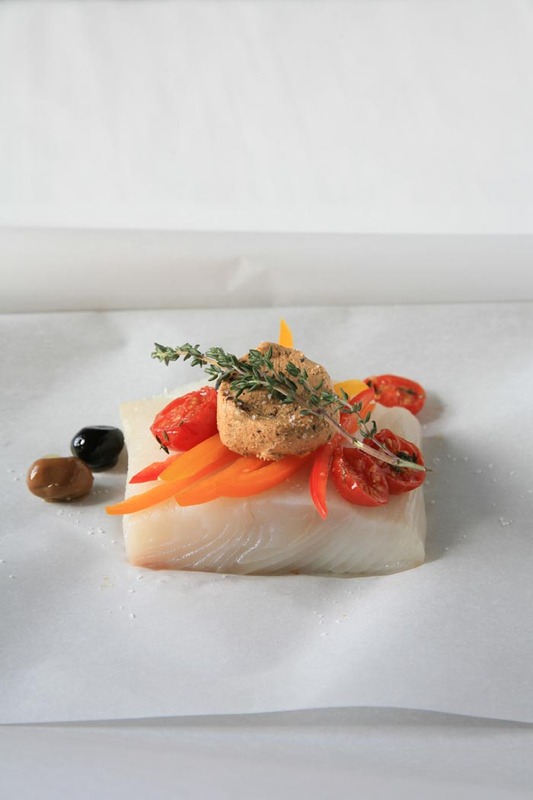 Whether your oven is big or small, cooking fish in parchment is as easy as it gets. The fish — any variety is fine — is topped with sliced vegetables and a generous pat of flavoured butter and baked in a tidy parcel of parchment. I always enjoy watching my guests tear open their packages, everyone pausing just long enough to inhale the fragrance first. Who wouldn’t love perfectly moist fish, steamed in its own juices and bathed in scented butter? It doesn’t take a trip to France to create a memorable meal, only the freshest of fish and a courageous amount of butter. Spread the tomatoes on a parchment or foil-lined baking sheet. Drizzle the tomatoes with olive oil and sprinkle with fresh thyme and a generous pinch of kosher salt. Roast in the oven for about 7 to 10 minutes until softened and aromatic. Cut 4 sheets of parchment large enough to encase the fish and vegetables, measuring about 16” x 12” each. Fold each sheet in half, leaving four “envelopes” about 8” x 12”. Open an “envelope” and place one portion of halibut in the centre of one side; season with kosher salt. Add a quarter of the sliced peppers and roasted tomatoes. Top with a disk of olive and caper butter (about 1 generous tablespoon) and a sprig of fresh thyme. Using a pastry brush, lightly coat the edges of the parchment with the beaten egg white. Fold the parchment in half to enclose the fish, and press the edges together to seal. Fold or crimp the parchment edges to reinforce the packet. (It’s important to seal the edges properly, to keep the steam in.) Using a pastry brush, lightly coat the top of the packet with the vegetable oil to prevent it from burning. Place on a baking tray. If not cooking the fish immediately, refrigerate the packets until ready to cook. Then allow them to warm at room temperature for about 15 to 20 minutes before placing them in the oven. Bake for about 7 to 8 minutes or until the packets puff up and the fish is just cooked. Serve immediately on warmed dinner plates. Allow your guests to open each packet themselves. As soon as it’s sandal-wearing weather, I dust off my ice cream machine and start tinkering with sorbet (and ice cream) recipes. I’ve made sorbets with everything from grapefruit to cucumbers. Any sweetened fruit (or vegetable) juice works nicely, and it’s fun coming up with your own tasty variations. Sorbets make refreshing desserts, welcome interludes between courses, and creative cocktails laced with gin or vodka. 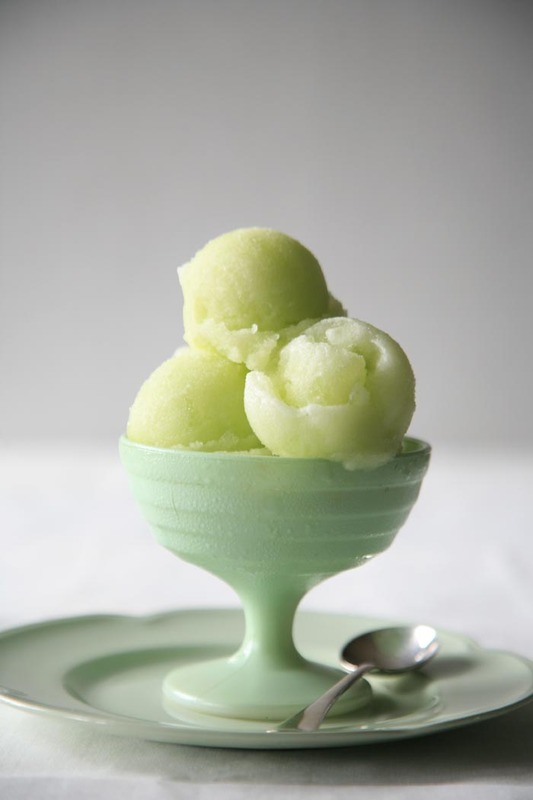 Even if you don’t have an ice cream machine, you can still make a frosty honeydew granita using this recipe. (I’ve provided instructions below.) Sorbets are smooth-textured, whereas granitas are more granular. You’ll need to plan ahead – if using an electric or hand-cranked ice cream machine, you’ll need to freeze the canister insert 24 hours before using. 3 tablespoon freshly squeezed lime juice (approximately 1 lime), plus more as needed. Cut the melon in half and remove the seeds. Scoop the flesh from the melon and chop it coarsely. Place the chopped melon in a food processor and puree. Strain the pulp from the liquid; you should have about 2 cups of strained melon juice. Add the lime juice and 1 cup of syrup. Taste the sweetened juice. Depending on the ripeness of your melon, you made need to add a bit more lime or sugar syrup. Place the sweetened juice in the refrigerator until chilled thoroughly. When the juice is well chilled, pour the mixture into a frozen ice cream canister and freeze according to manufacturer’s instructions. 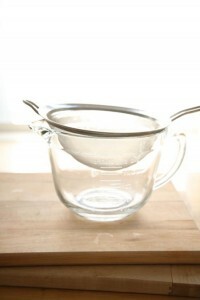 To make a granita – Pour the mixture into a wide shallow container and place in the freezer. When the liquid starts to form ice crystals, drag a fork along the bottom of the container to agitate and turn the mixture. You’ll need to repeat this every half hour or so until the mixture is icy and fairly uniform.